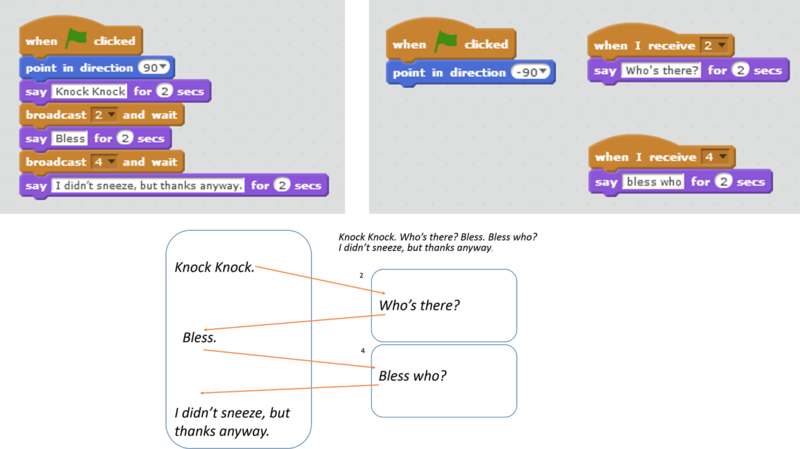 I have had to revise my thoughts on using these blocks after my experiences with Scratch Junior and year 2 children. 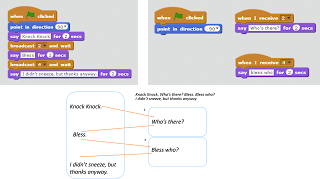 I used to think that broadcast was a bit of an unnecessary complication but having seen KS1 children using the envelope blocks in Scratch Junior which perform the same task, admittedly restricted to 6 colours, I now embrace all of the complications of broadcast! The terms “broadcast” and “when I receive” are a little techie. I explain broadcast as a big shout, loud enough to wake up something that is sleeping. BBC often features in this discussion. When I receive means that the sprite has heard the broadcast. Sometimes it leads to a discussion about whether or not all the sprites hear the message but that only the ones programmed to respond will do so. I’ve tried a few projects but knock knock jokes are really successful. I have a pot of jokes ready for children who don’t have a favourite one, you can click here to access the file of suitable jokes. These jokes work well because there is a clear and well defined sequence of actions, ready to be controlled using broadcast and when I receive. 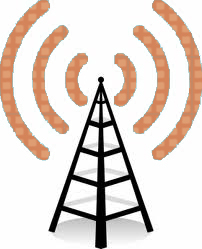 The sprite that starts the joke is the one in control, initiating actions using broadcast. The other sprite responds when a message is received and then control reverts back to the first. By working with this simple design, children understand that broadcast is a way of changing the order in which blocks are executed. After this initial success other projects can be tackled. Perhaps allowing each sprite to broadcast and respond. Perhaps also using broadcast without the wait so that sprites can act at the same time. Using extra sprites can also add complexity. It is also possible to have more than 1 sprite receiving the message at the same time and acting upon it; not necessarily doing the same thing. The power point file I use for the lesson can be found by clicking here.